May We See Photos of Things You've Made? The top is done, but it still needs a back and to be put together. And how funny is it that I've used both the purple and the orange on a quilt for my best friends daughter?! Wow, and I like that the rainbow is 'anatomically correct' Very pretty. 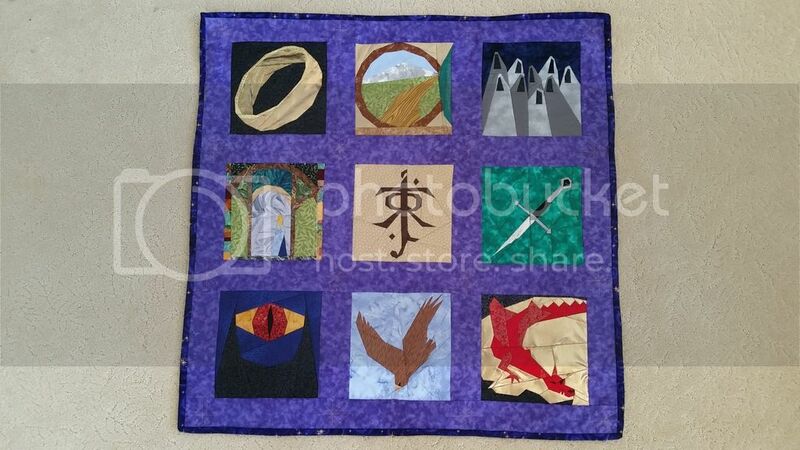 @TravelingDesign I finally finished my Hobbit/LOTR quilt. It's a wall-hanging, rather than a bed quilt. 2 1\2 feet square. @wireknitter OMG. You did a fantastic job!! I still can't believe you don't quilt with how great that quilt turned out!! How long did it take you to do it? I need to add an Avengers themed quilt to my never ending list of stuff to sew. I made the blocks fairly quickly, I think because I was so excited to see them come together. The simplest one, the Eye of Souron (only one section with large pieces) only took an hour or two. Smaug was the most complex and I worked on him for maybe 10-12 hours overall. It's hard to see in the picture, but the eagle has directional fabric which was difficult to work with. I started in March and just finished, but it hibernated for a while. In that time I also made a Lightning McQueen block and emblems for Batman and Spider-Man for a friend. I really like doing them and am deciding on a new project, probably Dr. Seuss. Fabric matting for framed photos. A jewelry holder for travel or an earring holder. I pieced the top for this quilt seven years ago from hand-dyed cottons. And then I went through six years of Really Bad Things where the top sat neglected in a box. I rediscovered it a few months back and decided to quilt it for my own use. I did an all-over pebble design for the quilting. That's the first AND last time I'll quilt a king-sized quilt on my home sewing machine. It was quite the workout! W O W @TheHilariest! That is really great! Did you hand dye all the fabric yourself too? I really love the pebble design too! Thank you! @travelingdesign - although I have dabbled a bit with fabric dying, I purchased the fabric for this quilt from a local shop. The pebble design is SUPER easy and I love the texture it gives the quilt. @TheHilariest for some reason the image is not showing up for me. I'm just starting to learn free motion quilting and have not tried pebbles yet. I have done a few really good circles, but most of them are a bit wonky. It's going to take a lot of practice. @thehilariest They aren't showing up for me anymore either. Odd. Huh. That's weird. They're still showing for me, but now I can see the images for the Rainbow and LOTR quilts that weren't displaying when I posted the other day. BTW - they're gorgeous, wireknitter! My first attempt at a wreath. Pretty proud of myself.. got a new hobby! @allie07 the owls are so cute! Nice job. Thank you all! Gonna start on a Christmas themed one. I'll post a pic when finished. @wireknitter, your quilts are amazing!! @allie07, I love the wreaths! Did you make the wreaths themselves, or add the birds to wreaths that a less crafty person can buy? 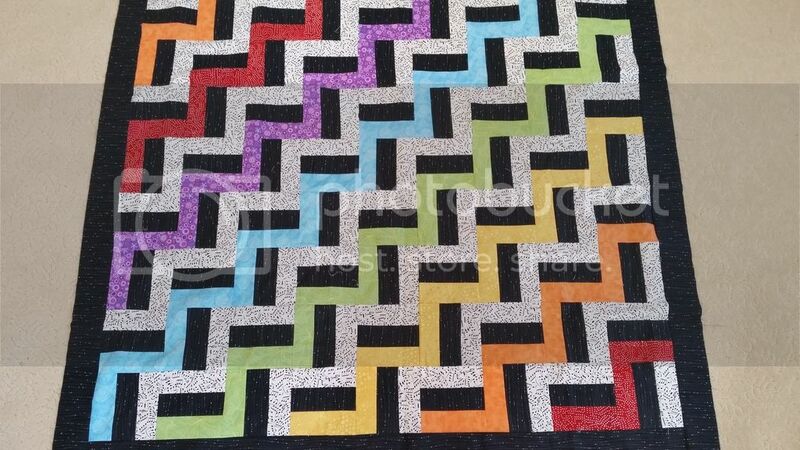 @TheHilariest, I can't see your quilts, and I really want to!!! 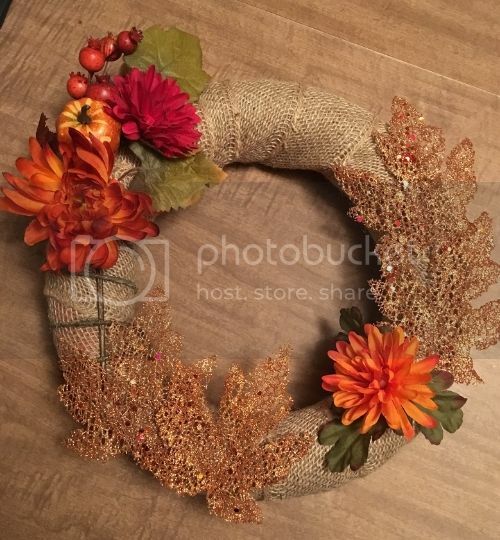 @OffToSeeHim Got all the supplies at Hobby Lobby, except the twigs (came from an old wreath my mom didn't want anymore), and it was super easy! Not a crafty person at all and didn't even know what I wanted to do until I saw the owls. 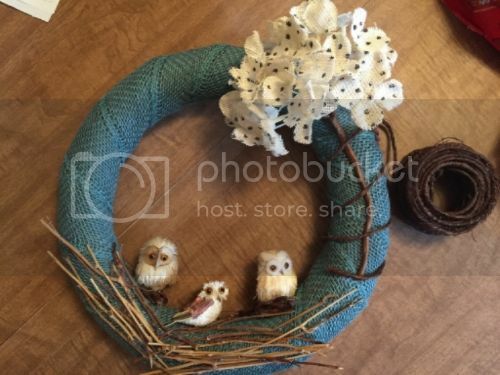 Foam wreath, burlap, twine, flower, owls, twigs and hot glue/gorilla glue was all it took. The owls are sitting on twine nests - I didn't know how else to put them on lol. @OffToSeeHim I think you could!! wrapping the burlap is the hardest part but I don't care if it's perfect or not! Made another one for Thanksgiving real quick. I think Photobucket is messing with my pictures, so I'm trying a different hosting site. Do these show up?